Quick Info: Our Necklaces are priced per strand (individual necklace) but packed in groups of 12 strands. Please order in increments of 12 strands. ALL OUR MARDI GRAS BEADS MEET OR EXCEED CPSIA STANDARDS FOR ALL 50 STATES. 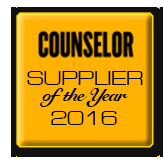 PURCHASE FROM US WITH CONFIDENCE! Raise a toast to fun with our Gold Beer Mug Bead Necklaces! These gold beer mug beads are guaranteed to be a hit at Oktoberfest events, bachelor parties, poker games, 21st birthday parties, or any other event where alcohol takes center stage! 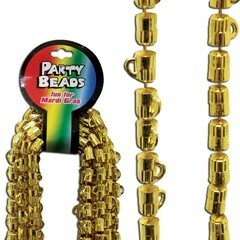 Each 7.5 mm bead is shaped like a gold beer mug, making these necklaces a fun and fabulous party favor! Stock up on gold beer mug beads before any big event and you'll be sure to wow your guests! Our 33 inch gold beer mug beads will make any event a little more fun whether you're taking part in the drinking fun or serving as designated driver. Use our gold beer mug beads as party favors or incorporate them into your party decor by draping them over chairs, stair railings, centerpieces, and anywhere else you want some extra color. The possibilities for using your gold beer mug beads are practically endless! You can even mix and match with our other party beads for a more colorful event.